Discussion in 'Family Worlds' started by Phillip, Jul 6, 2012. This Saturday morning don't forget that Jim Henson's Pajanimals begins airing on NBC's new kids block featuring Sprout programing. Saturday's show will air at 12:30 central, 1:30 eastern after Tour de France. Beginning next week, Pajanimals will air at it's normal time slot at 9:30 central, 10:30 eastern. If you don't have Sprout and want to find out all about Pajanimals be sure to tune in. Hopefully Pajanimals will air in full 16:9 on NBC. (The show is broadcast is 4:3 letterbox on PBS Kids Sprout.) Find out more about NBC's new Sprout shows here. If you plan on watching Pajanimals, please like this post and let us know your thoughts on the show. littlelotto and Hubert like this. Yaay! I've been really excited about finally being able to see the Pajaminals...it seems to look like a very fun and musical show. 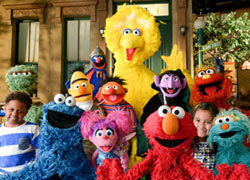 A new Jim Henson puppet show...on network tv. This is very very good news. Woo and on my birthday! That's great news to hear! It's already been pre-empted on my NBC by the Tour de France. EDIT: Oh wait a minute, I just realized that it's gonna be on at 1:30 PM. Yaay! Yes, it's airing later than usual for the first week due to the Tour de France. In most markets it airs at 12:30 central, 1:30 eastern. Well, I'm not seeing it at all on the schedule for tomorrow, and the Tour de France is playing through 1:30 eastern. This may be a channel by channel situation depending on your local affiliate and perhaps your region. Here in Phoenix (West coast/Pacific time), TdF is on from 5-9 am with Pajanimals coming on at 9:30. So glad to see it on a regular station too! My kids and I love this show, I love the music! It's not on in the west coast until 4:30... set the DVR so I don't forget. 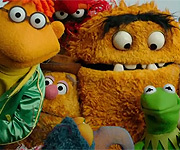 I don't know where else to post this question, but is this a Disney production or something Brian Henson is working on? Since the Jim Henson Company was sold to Disney, the Henson family gave up their rights to the Jim Henson and Muppet names, didn't they? I would really love to see the Henson family re-emerge into the muppet world somehow, but am almost certain this isn't possible anymore. The Jim Henson Company wasn't sold to Disney, just what we now consider "The Classic Muppet" characters (Kermit, Piggy, Fozzie, Gonzo, etc). That's all that was sold to Disney, everything else JHC still holds the rights too (except for Fraggle Rock, they just up and gave the rights to that one away). I sorta did this thing called forgetting today...so I was only able to catch the tail end of it, but I did like what I saw. I wouldn't know, because again, not only was it completely pre-empted by the Tour de France, but there wasn't a later broadcast or repeat or anything, so I missed out completely. That's awesome that the Jim Henson Company still exists then. No, JHC still has the Fraggle Rock stuff, doesn't it? They still have the Fraggle Rock rights. I don't know where you hear they didn't. Maybe the MOVIE rights, not the rights to the show. The second episode of Pajanimals airs this morning at 9:30 central, 10:30 eastern in most areas of the country. (Check local times in your area.) The episode features the shorts, "A Present for Mom" and "Queen for a Night". Tune in on NBC and let us know your thoughts. It doesn't come on here until 4:30 pm again.